Dublin has become an exciting metropolitan for its residents and a thought-after destination for global travellers. There’s no need to explain why one should visit Dublin; it is quite obvious. But there are definitely many intriguing facts that most of us don’t know about Dublin, historical and cultural bits that make this city even more delightful and visit. So here’s a taste of the less-familiar side of Dublin. The area known today as Dublin was invaded in 841 BC by none other than Viking warriors. This was the Viking era, when those enthusiastic warriors saw no boundaries to their conquering quests. The deep waters and relatively mild weather provided a safe shelter for the Viking fleet. Two years later, in 839 BC, the Kingdom of Dublin was established and Turgesius, the viking chief, was crowned as its king. Stormy days were ahead for Dublin, times of constant fighting and succession wars. Turgesius was captured and drowned in 845 by Mael Seachnaill, who was dealt the same fate by King of Laithlind in the battle of 846. Next to capture Dublin was the King of North Brega, Cinnaed who was defeated by Tigernach in 851. In 853, Olaf the White arrived in Dublin… you get the idea. Two full centuries of raging Viking craziness ended in 1171 when the last Norse king of Dublin, Ascall, son of Ragnaill, was killed. Only then did Dublin society, and Ireland as a whole, begin to gradually evolve to the joyful place we know today. 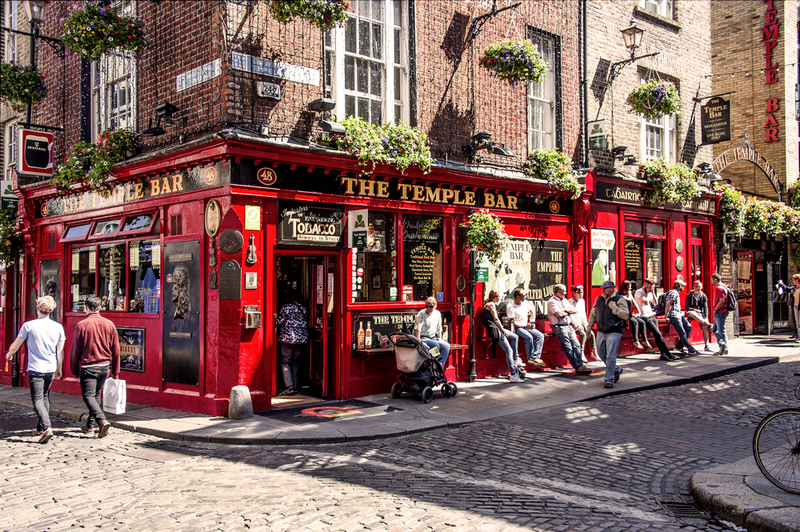 We at Sweet Inn fondly describe Dublin as a giant, friendly pub and in many ways it is – it’s definitely the most pub-friendly city in the world. These 751 pubs (according to the last count in 2015) serve up beers to the half a million residents of Dublin, which comes to about one pub for every 666 residents. If you take out of the equation minors under the age of 18 (the legal drinking age in Ireland) – about 25% – you are left with one pub for every 500 thirsty Dubliners. So one can imagine, that under certain circumstances, all of these 500 Dublin residents above the age of 18 can theoretically be in a local pub at the same time and raise their glasses of Guinness to toast the truly remarkable city they live in. Did you know? Dublin’s oldest pub is the Brazen Head, established in 1198, a mere 27 years after the last Viking vacated the city. The lion in the MGM logo – not a person, but a lion named Slats, born at the Dublin zoo in 1919. This sounds like one of those oddities that can only be true in Dublin – a bridge that has the same length and width! It is true. The O’Connell Bridge (in Irish: Droichead Uí Chonaill) is almost a perfect square – 45 meters length by 47 meters width (147 by 155 feet.) It crosses the River Liffey, joining three very Irish-sounding streets – O’Connell, D’Olier and Westmoreland. It was built between 1791 and 1794, which begs the question – was anything built in Dublin in the last century? To sum up this wonder of a bridge we have to mention Arthur Fields, hailed by Dubliners as “The Man on the Bridge”. Fields received this nickname for taking no less than 182,000 photographs of pedestrians on the bridge from the 1930’s to the 1980’s. Sweet Inn recently launched in Dublin – our 11th city – and counting! Our stylish apartments are located in close proximity to Grand Dock Canal (nicknamed “Silicon Docks”) the modern and upscale residential and business hub. So there you have it – yes, some things were built in Dublin in the last century. The Docks are an ultra-modern mini-city built on the banks of the Grand Canal and house the European headquarters of the world’s most famous tech companies, such as Google, Facebook, Twitter, LinkedIn as well as dozens of startups. The spacious and well-equipped Sweet Inn apartments are ideal for both business and leisure travelers looking for a unique angle to enjoy Dublin. If you’re planning to make Dublin your next vacation destination – and we cannot think of any reason why you wouldn’t – make sure to check out our incredible Dublin apartments. I love Dublin! Such a beautiful place with so much to do.